Clay is the hands down favorite when it comes to sculpting… It’s tactile nature makes it probably the best media for the gestural works my hands form. Then, there are glazing options… The fun thing about firing clay is you never know what you’re going to get. It can be a real crap-shoot. Some of my best works are “happy accidents” in the final firing. If it’s not clay, then it is found objects. I tend to stay away from manipulating raw products such as steel or plastics. Recycling objects is both green, intriguing and cost effective. Then there are the UN-conventional sculpting mediums… such as “spray cheese and Triscuits.” Triscuit Stonehenge was one of my all-time favorite works. Too bad I dropped it… Triscuit Parthenon is a close second. 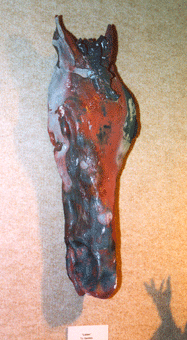 Listen 2001 - Raku Clay, Pit-Fired Exhibited at National Arts Club in NYC. I still have this piece. The pitfire we did at Cascade Farm with my ceramic buddies and potter Reed Asher was enormous. It was a fun day with great results. I’m reluctant to let this one go. It’s one of a kind and holds a special place in my artistic heart. If someone offered the right price, I might relinquish it to a good home. It’s been to several major art shows in New York and Connecticut regions. This was the result of a fabulous overnight wood fire at Putnam County artist’s kiln. I just blew me away when it came out. So, I keep this one too! However, if the right price shows up, I might just let it go – but only to a good home! This piece has shown in around New York in Saratoga, Poughkeepsie, etc. 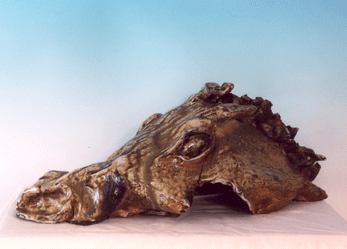 The Hay Burner 2002 - Fiberglass Horse Wrapped in Baling Twine for Horses - Saratoga Style Exhibition. The Hay Burner was definitely an experiment. 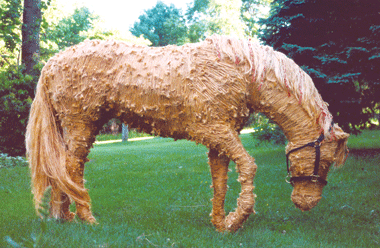 Saratoga County Arts Center’s first “Horses – Saratoga Style” exhibition took on my proposal to wrap a fiberglass horse in bailing twine (the string that goes around the hay bales for the horses). Most folks opted to paint. I just couldn’t be suckered into the normal routine. 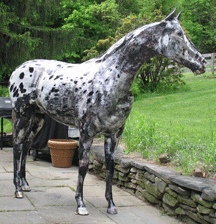 This was sold at auction to the Saratoga National Golf Course. Unfortunately, the kept it outside and did not apply the recommended coat of sealant each year, thus it has disintegrated for the most part. I would love to re-do it eventually. We’ll see if I can coordinate it at some point. I would be willing to recreate another one of these for seriously interested parties. Side-note: With the commission for this piece, I bought my first horse, Blackjack (Avatar Navajo Bearclaw). This is Bj when I first bought him. He's quite a looker and he knows it! 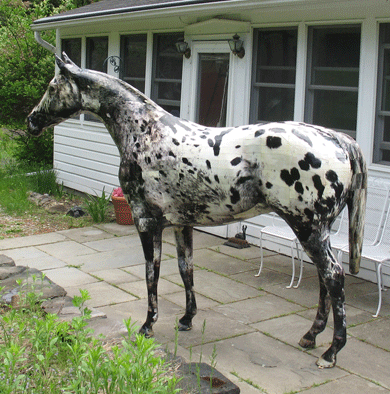 The second “Horses Saratoga Style” I proposed covering the model with photographs of my entire horse. This was an enormous undertaking and very complicated. However it was successful. Unfortunately the photographs responded unfavorably to the coating the was recommended. The piece turned purple from the sun and was eventually replaced. This does not deter me from experimenting. Under different conditions it would have worked well. There is not growth without an attempt. It was an excellent time related piece. The color transformation was intriguing. Blackjack meets Snapshot - Yes, Bj was a little wigged out. 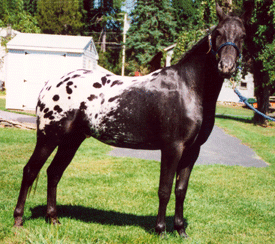 Notice Blackjack has changed color over time. One day, he too will be purple.